Libertarian Party presidential nominee Gary Johnson has been pitching himself hard to disenchanted voters in an election cycle which might contain a record number of them. Unfortunately for his campaign, he didn't hit the 15-percent polling threshold in September which would have earned him a podium at the first presidential debate. But Johnson didn't keep quiet on Monday night. He live-tweeted the debate, offering a window into how it would have been different if he were there. I believe Johnson would have enriched the debate by raising issues and proposing policies that neither Hillary Clinton nor Donald Trump presented. For starters, Johnson would have been the candidate on stage who offered the most unabashed support for free trade. Clinton has a mixed voting record on free trade agreements, and, though she expressed early support for the Trans-Pacific Partnership (TPP) currently on the table, she has more recently spoken against it. Trump blames free trade agreements for the loss of American jobs. 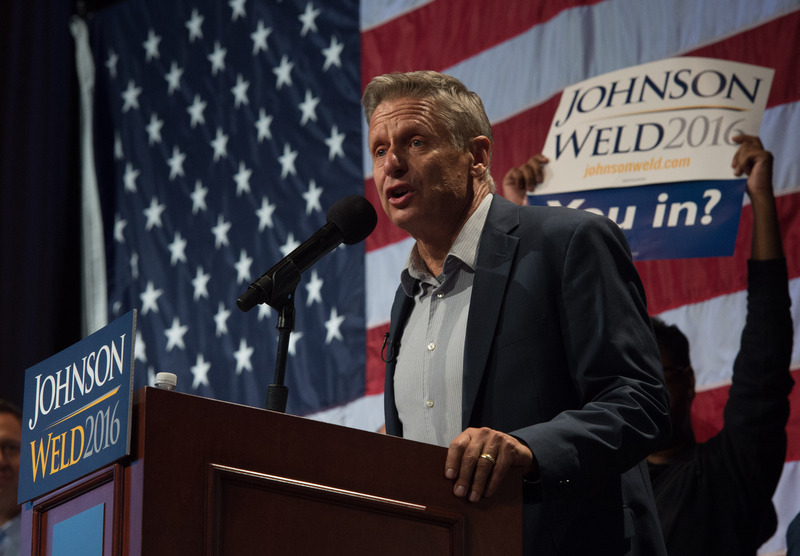 Johnson, in typical Libertarian fashion, is generally opposed to government regulations of business, and supports the TPP. It would have been interesting to hear Johnson's defenses of free trade, and why he thinks such agreements create jobs within the United States rather than exporting them to lower-wage countries. Another novel perspective Johnson would have added to the debate is his stance on taxes, which differs dramatically from Trump's proposed across-the-board tax cuts and Clinton's more progressive taxation proposal. Johnson wants to eliminate corporate and income taxes completely, replacing them with a consumption tax; you'd be taxed based on how much you spend, not how much you make. In order to prevent low-income individuals and families from paying more than they can on basic necessities, everyone (regardless of income) would receive a "prebate" check for $200 a month for such necessities, essentially compensating people for the taxes paid on those. In my opinion, the most significant issue Johnson would have likely inserted into the debate is the "War on Drugs." Though the candidates discussed criminal justice, and Clinton spoke to the problem of mass incarceration along with racial injustice (while Trump relied heavily on the phrase "law and order" without offering much detail), drug policy did not come up. Ending the drug war is a cornerstone of Johnson's criminal justice reform plan, with a particular emphasis on removing marijuana from the list of Schedule I drugs. That would enable states to legalize marijuana for recreational and/or medical use without interference from the federal government. While he'd keep other drugs illegal, Johnson has said he doesn't think people should be put in jail for using such substances, favoring rehab and harm-reduction programs over incarceration. With so many Americans unhappy with their major-party options, it's regrettable that they didn't get a chance to hear from a third candidate on Monday. Heading into October with a polling average of 7.4 percent, it's unlikely Johnson will qualify for the second debate on October 9. Regardless of where I stand on the issues above, I think Johnson would have inserted valuable points and perspectives into the debate, as well as pressed Trump and Clinton on critical issues. I would have welcomed all of those additions Monday night.